Have you been busy baking for Christmas? Yes??? Will you want to bake more Christmasy cookies? No!!!??? 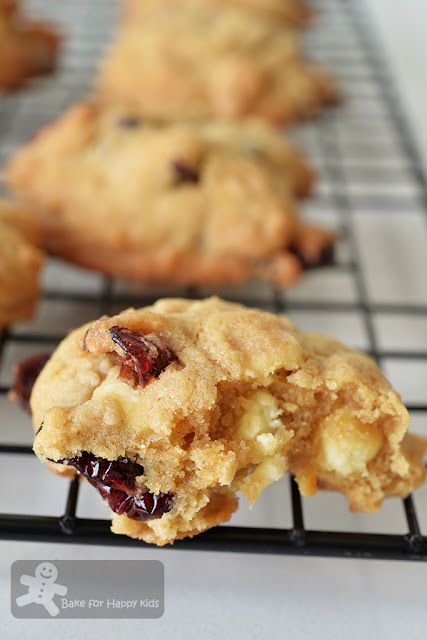 Will you consider baking if you know that these fully loaded white chocolate cranberry macadamia cookies are crispy, crunchy, chewy, fruity, nutty and very very very delicious!!! Many who have tried baking with this highly reviewed recipe from Epicurious say that they will bake it again. I will. Will you??? 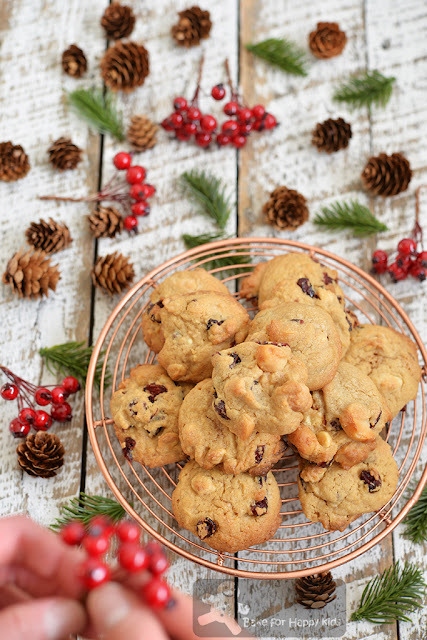 I have been baking these cookies more than once; in fact, many times... And this time, I tell myself that I have to mention this lovely cookie recipe for the coming Christmas season. So will you bake these delicious cookies for your Christmas??? 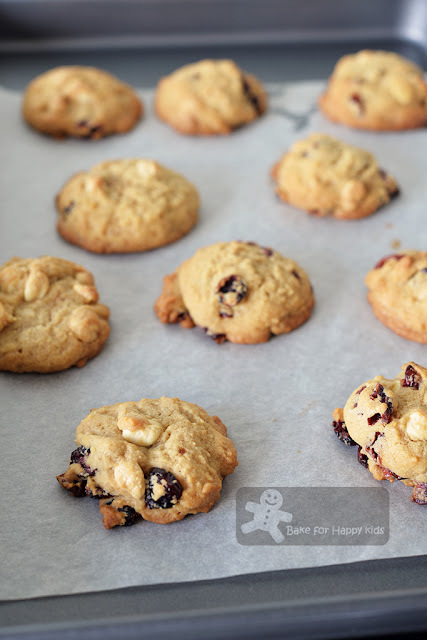 Not a fan of white chocolate cranberry macadamia cookies? You may wish to know that you can use this versatile crispy crunchy cookie base to re-create your cookies all accordingly to the way you want. If you don't add dried fruits like raisins, sultanas and dried cranberries into your cookies, they will be purely crunchy and less chewy. If you don't add nuts into your cookies, they will be less crunchy and more sweet. If you add dark chocolate instead of white chocolate into your cookies, they will be less sweet. Me? My husband wants his cookies with white chocolate, dried cranberries and macadamia nuts whereas my sweet-tooth son wants his cookies with white chocolate and dried cranberries. Hence, I have to bake both combinations. Baking these cookies is easy! And I have a one-minute video to show you how I baked mine. 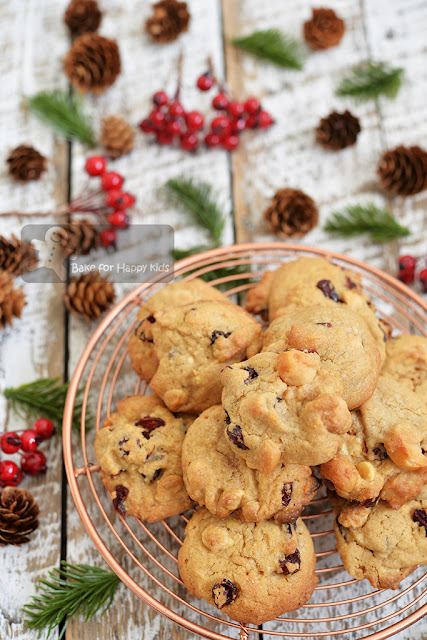 Want these crispy crunchy chewy nutty white chocolate cranberry macadamia cookies for your Christmas? Yes!!! You can bake them!!! Every time my husband and son ate their last cookies, they will ask me to bake these cookies again. I will. Will you? *You can omit or replace these ingredients with the same amount of any dried fruits, chocolate chips and nuts that you want. Using an electric mixer with paddle attachment, beat butter and both sugars at medium speed for about 2-3 mins until light and fluffy. Using the same mixing speed, beat in the egg bit by bit and then the vanilla and beat until well combined. Remove mixture from the electric mixer. Sift in the flour mixture and use a spatula to mix until the flour is incorporated into the mixture. Stir in cranberries, white chocolate chips, and nuts. Drop or roll one tablespoonful of dough onto the prepared tray with about 2 inches (5 cm) space apart. These cookies won't spread crazily during baking and so it is ok to place them with just 5 cm apart. Bake cookies or until golden brown at their edges, about 15 min. Allow cookies to cool slightly on the tray for about 10 mins. Transfer onto a wire rack to cool completely. Cookies will be cake-like with crispy edges when they are warm and freshly baked and will be firm, crunchy and crispy when they are completely cooled and will stay crunchy and crispy up to 5 days when they are properly stored in airtight container. Store in an airtight container up to 5 days at room temperature. Zoe, I will love these cookies! Never mind if they are sweeter than what I am used to. I will eat in moderation. I promise. LOL! I am just drooling at these cookies... amazing! Sooo yummy! 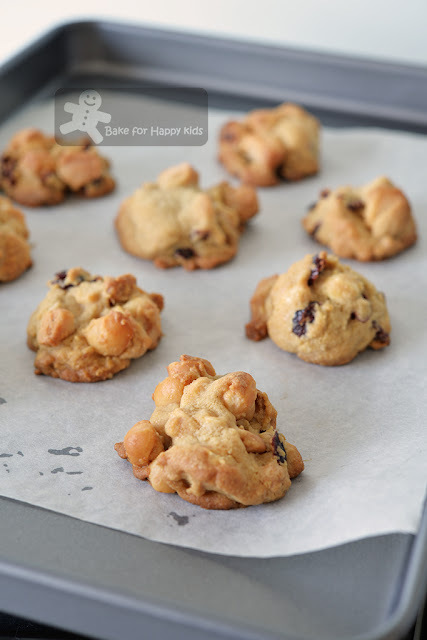 I've had so many friends say they love white chocolate cookies with nuts, especially macadamia! It's really easy to get them now and they aren't so pricey.